This fascinating history shows how African-American military men and women seized their dignity through barracks culture and community politics during and after World War II. Drawing on oral testimony, unpublished correspondence, archival records, memoirs, and diaries, Robert F. Jefferson explores the curious contradiction of war-effort idealism and entrenched discrimination through the experiences of the 93rd Infantry Division. Led by white officers and presumably unable to fight—and with the army taking great pains to regulate contact between black soldiers and local women—the division was largely relegated to support roles during the advance on the Philippines, seeing action only later in the war when U.S. officials found it unavoidable. Jefferson discusses racial policy within the War Department, examines the lives and morale of black GIs and their families, documents the debate over the deployment of black troops, and focuses on how the soldiers’ wartime experiences reshaped their perspectives on race and citizenship in America. He finds in these men and their families incredible resilience in the face of racism at war and at home and shows how their hopes for the future provided a blueprint for America’s postwar civil rights struggles. 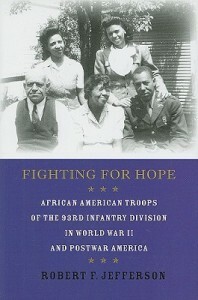 Integrating social history and civil rights movement studies, Fighting for Hope examines the ways in which political meaning and identity were reflected in the aspirations of these black GIs and their role in transforming the face of America.